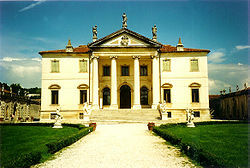 The Province of Vicenza (Italian: Provincia di Vicenza) is a province in the Veneto region of Italy. Its capital is the city of Vicenza. 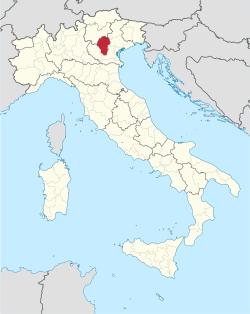 The province of Vicenza has an area of 2,722.53 km2 (1,051.17 sq mi). The southern part is largely flat (the Pianura Padana, here known as Pianura veneta) except for a group of small hills (the Berici Hills), south of the city of Vicenza. There are many high mountains in the northern part of the province; the highest mountain of the province is Cima Dódici 45°59′51″N 11°28′5″E﻿ / ﻿45.99750°N 11.46806°E﻿ / 45.99750; 11.46806﻿ (Cima Dódici)) that is 2,336 m (7,664 ft) high and is on the border with the province of Trento (Trentino-Alto Adige/Südtirol region). 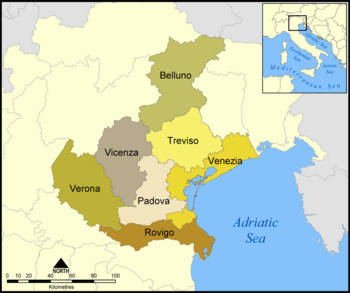 The province of Vicenza borders to the north with the Trento province (Trentino-Alto Adige/Südtirol region), to the northeast with the Belluno province, to the east with the Treviso province, to the south with the Padua province, and to the west with the Verona province. As of 1 January 2016[update], there are 867,314 persons living in the province, for a population density of 318.6 inhabitants/km². The following shows the 12 comuni with the population, and the area and altitude. ↑ "Il Presidente" (in Italian). Provincia di Vicenza. Retrieved 19 May 2017. 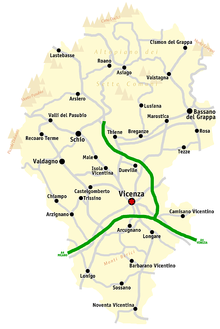 ↑ "Provincia di Vicenza" (in Italian). Tuttitalia.it. Retrieved 19 May 2017. ↑ 3.0 3.1 3.2 "Statistiche demografiche ISTAT" (in Italian). Demo.istat.it. Retrieved 19 May 2017. ↑ "Cima Dódici, Italy". Peakbagger.com. Retrieved 19 May 2017. ↑ "Comuni in provincia di Vicenza per popolazione" (in Italian). Tuttitalia.it. Retrieved 19 May 2017. This page was last changed on 20 August 2017, at 07:51.